How close are virtual reality systems to becoming mainstream apps? A decade ago, experts said that virtual reality systems were just around the corner from fulfilling their promise. Many people believed the ability of these products to create lifelike simulations would have a dramatic impact on everyday life by providing interchangeable real and virtual worlds. Clearly, they thought, this emerging technology would bring major breakthroughs in training, education, entertainment and a host of other fields. The Datavisor 80 from n-Vision has a wide, 80-degree field of view and 1,280- by 1,024-pixel resolution. It's priced at $90,000. Unfortunately, VR technology has yet to live up to its lofty potential. Performance and price have yet to meet users' expectations, and industry analysts have now extended their timeline for the emergence of a truly immersive virtual world. But despite its slow progress, VR hardware is continually making inroads into new professions as manufacturers improve the capability of their products. Commercial and military pilots use VR flight simulators to familiarize themselves with new aircraft. Architects and engineers use the latest equipment to explore the impact of design plans or modifications before committing real resources to the task. And surgeons are increasingly employing similar tools to try new techniques on virtual patients. Perhaps no piece of hardware better represents the virtual reality concept than the head-mounted display (HMD), the futuristic-looking, football-helmet-sized devices many users identify with VR technology. 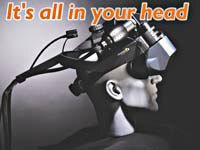 An HMD typically includes a set of goggles or a helmet with small monitors for each eye that generate 3-D images. Frequently the HMD is integrated with a head-tracker system that allows displayed images to change in concert with the movement of the user's head. Over the past few years, the variety of products falling under the general heading of HMDs has broadened significantly. They range from the traditional, full-helmet systems used extensively in military and commercial avionics training to eyeglass-sized monocular systems such as the lightweight display developed by Xybernaut Corp. to support its Mobile Assistant wearable computer. For this survey, I've also included haptic displays, the immersive viewing devices that track the motion of the whole body as an aid to navigation within the virtual world. These products, such as the Binocular Omni-Orientation Monitor from Fakespace Inc., are used extensively in scientific visualization and engineering projects at organizations such as Lockheed Martin Corp. and NASA. Two key specifications drive HMD selection: resolution and field of view. Resolution, measured in resolvable dots or pixels, dictates image fidelity. The higher the resolution, the more realistic the image. The ProView 60 from Kaiser Electro-Optics has a 60-degree field of view and is priced at $5,995. Field of view has a direct impact on how immersed the user feels in an environment. This specification is typically defined in both horizontal and vertical terms and sometimes in diameter. The unit of measurement is degrees. An HMD with a wider field of view will present a more realistic feel to the virtual environment by presenting a more lifelike image. When selecting an HMD, however, it is important to note that resolution and field of view are, within a given price range, mutually exclusive. Although a few of the expensive models can combine both a wide field of view and sharp image resolution, usually the user will have to make a trade-off between the two. The importance of each of these specifications depends greatly on the VR application you'll use. An HMD that is used to train pilots by presenting a virtual display panel and buttons, for example, would require a high resolution so that the trainee could accurately manipulate the panel and buttons. On the other hand, a maintenance training application in which the user has to view the entire outside of the plane from a large-scale perspective would place greater importance on a wide field of view. Another key specification to watch is horizontal angular resolution. Manufacturers use this specification to define the overall visual quality of an HMD-generated image as measured in arc minutes per pixel. The smaller the value of this specification, the better the image quality. Generally, experts say the angular resolution of an HMD should be under 5 arc minutes per pixel. Another important consideration for an HMD is the unit's weight. As anyone who has worn headphones for long periods knows, even the lightest headgear can become irritating over time. Clearly, a lighter unit is more desirable, but weight distribution can be just as important. Look carefully at how evenly distributed the weight of a HMD is or how adjustable it is before making a selection. Users' desire for high-performance typically conflicts directly with manufacturers' attempts to minimize wear and improve comfort. Today's helmet-sized HMDs, for example, must combine many components to provide the sight and sound quality required to simulate a life-like environment. Over the past few years, however, manufacturers have significantly reduced the weight of their products by introducing new materials and more highly integrated electronics. For consumer applications, many manufacturers now offer HMDs that weigh only a few ounces.
' If your application requires you to read fine graphics or text, choose a device with high resolution rather than a broad field of view.
' 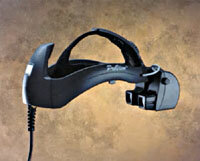 If the application calls for a broader, more immersive image, select a head-mounted device with a wide field of view.
' Generally opt for a horizontal angular resolution specification below 5 arc minutes per pixel.
' Weight and comfort go hand in hand: Choose an HMD that is as lightweight as possible to minimize head and neck strain.
' Pay special attention to the availability and accessibility of controls for video, sound and 3-D mode. Sometimes the smaller, often overlooked features in any high-tech device can determine its utility. HMDs are no exception. Pay close attention to features such as brightness and tint controls on the display or volume controls for the sound. Are they accessible and easy to manipulate? If you're buying a see-through device, does it offer a video mute control that will allow you to see through the lenses into the real world? How simple is the installation of the cabling and software? Finally, there is the major issue of price. Expensive HMDs can provide significantly higher resolution, more color depth and a wider field of view, which together can deliver a much more effective simulation. But the price of high-end products can run well beyond $10,000. Other products, such as glasses used in adding a VR dimension to viewing a screen, are sold for as little as $399. To some extent, prices are driven by the sheer cutting-edge aspect of the technology. For example, a problem for many manufacturers until recently was the limited supply of high-resolution miniature color LCD panels. As the technology has matured, however, vendors have introduced more cost-effective technologies or taken advantage of high-volume manufacturing. As a result, users now have a much wider selection of devices offering higher performance at lower cost. Vendors' ability to continue down that path will likely determine how widespread the use of VR equipment becomes. John H. Mayer of Belmont, Mass., writes about information technology.